Two weeks ago I got to pace and crew for my mom at Cascade Crest 100. Obviously, its a pretty special experience being able to run with your mom for the second half of a hundred miler! Here's a a few reflections on crewing, pacing, and just another awesome day in the mountains. After driving to Tacoma Pass with Betsy, we got to hang out and see a few runners come through before Mom got there. Since I've hardly ran any races in the last year, it was a real treat to hang out at the aid station. There are so many great people in the ultra running community, it was a pleasure just to stand around and talk. 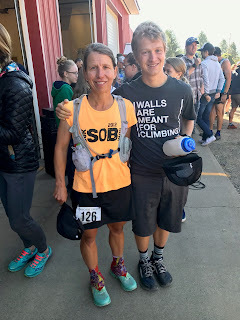 I was lucky enough to know quite a few runners at Cascade Crest so it was a lot of fun to see them come though. At just over 20 miles, everyone was pretty happy so that was a lot of fun. By the time Betsy and I drove onto the next crew point, the community at Tacoma Pass had got me super stoked to go run! The runners are gone, time to hit the road! At Stampede Pass, we got to hang out and talk with some other crews. 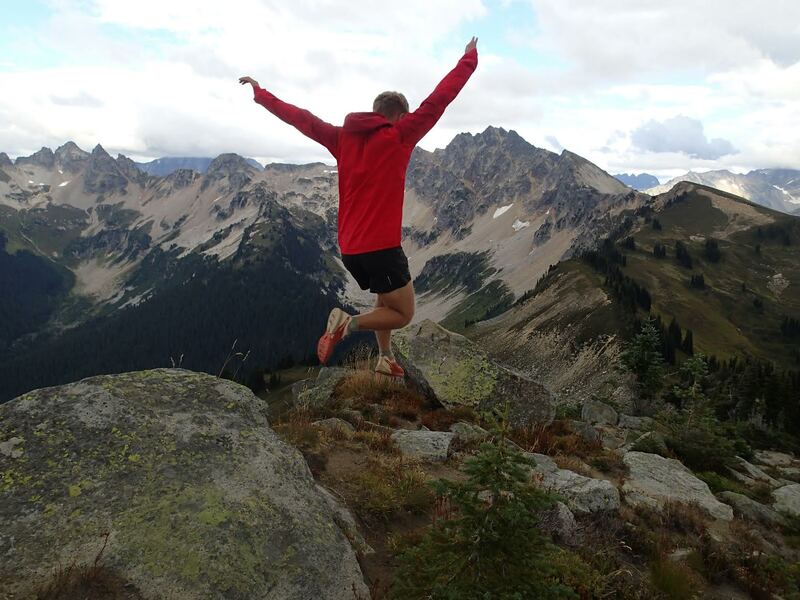 A few we'd talked to at Tacoma Pass, a few we hadn't see yet, so it was fun to hear how their day (and runner) was. At this point, we weren't really sure what time Mom would roll in since she was far ahead of her estimated pace at Tacoma. Sooner than expected Mom came in so we helped her refuel and get back on the trail. Once again she was looking great and left the aid station quickly! That was fun to see, and knowing I'd get to join her at the next crewable aid station was certainly exciting. So down the mountain we drove and rolled into Hyak. Betsy and I were able to hang out with Chris and Darla as we enjoyed our dinner and the cool evening views. Not long after dinner Chris and Darla got ready to crew for their runner Ashley. Ashley ended up finishing second, so she was a ways of Mom, but as the time ticked on I got progressively more excited to join Mom. As I started to get my gear ready to pace Mom, Betsy made me redo out pacing chart since Mom was now over and hour ahead of schedule! And soon after all that, Mom came in, ahead of even my most optimistic new pace chart! Mom was in good spirits and was in and out of the aid station quickly. In just there first few hundred yard of running, I knew the day was going well since Mom was very positive and relaxed. After Hyak, the race followed the same course as on the way out. Cascade Crest is not traditionally an out and back course, but due to the Jolly Mountain Fire the course had to be rerouted. An out and back was the only option. Leaving Hyak, Mom and I went through Snoqualmie Tunnel, before climbing up "the roped section". The course is steep and rocky here, so the roped were certainly helpful! After that, we continued hiking up. I was impressed how strong Mom was hiking, and had to wonder how long this would last. She was hiking very well, but I was equally impressed how smart she was being in regard to when to run and when to hike. In a hundred miler, pacing is key, and it certainly looked like Mom was nailing it! The dark hours rolled by and I got to enjoy the nighttime with Mom. We passed a few runners, and a few runners caught up with us. But it was mostly just us, alone with the whispers of wind. We talked a little bit, and I offered some encouragement, but mostly just moved along down the trail. This section of the course was pretty rocky and rooted, and having never been on the Cascade Crest course before, I was impressed how tough that race is. We moved through aid stations quickly and were soon enjoying some smoother trails that also had a few more downhills in it. Mom had been so positive that I was a little surprised when on one downhill she complained, "My quads hurt." Well, I said its usually just starting a downhill that painful and after a few strides they won't hurt as bad. While this is certainly true, I also through, Mom your 70 miles in, I'm not surprised your quads hurt. Just a mile or two later, we rolled back into Stampede Pass and were able to refuel. Betsy was there with our gear and once again helped Mom and I get going quickly. I can't thank Betsy enough, because without her, it would have been a whole lot less fun. Betsy was extremely positive and upbeat all day (like usual) and did an awesome job crewing! Stampede to Tacoma was rolling, relatively smooth trail. After all, it all PCT through that section. 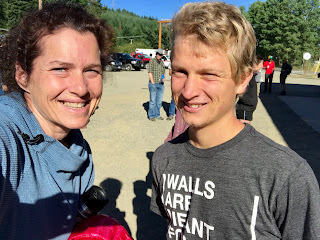 I know how the race can start to seem really long, yet not at all close to being done after mile 70, so I tried to keep Mom focused about just making it to each aid station. She seemed to be doing a really good job of this herself, so I started to talk about how cool it would be to see the sunrise. And I can say, it was pretty awesome. First we could start to make out the outline of trees against the night sky. Soon after, we could notice the sky start to lighten. As the trail drifted in and out of small meadows and denser sections of trees, we could really notice a difference between the two. And then it was light. It happens so fast. One minute we had headlights on then they were off and it was morning. Outside of the sun rising, the highlight for me was all the huckleberries along the trail. I love huckleberries so seeing bushes loaded with big dark berries was awesome. But, being a good pacer, I promised Mom I wouldn't start eating any, because if I started I wouldn't be much use. She might be to the finish line before I'd think to move on from the berries and try to catch up! And then came Tacoma, with just over 20 miles to go. Once again Betsy was ready and waiting, making sure Mom and I got rid of our light before we took off for the final stretch. After leaving Tacoma Pass, we hit a long uphill. There was quite a few little downs and flat sections, but for a long time we kept grinding upward. And Mom kept hiking as strong as ever. I had to tell her that she was doing awesome because she was hiking just as fast as when I started with her. Soon we were out of the morning cool and the day started to heat up. Mom started wanting ice in her bandana when we reached aid stations. While the aid station volunteers got her bandana filled, she did a great job of eating at the aid stations. I told her to keep fueling consistently throughout, so when she started to get tired of gels, she ate a bit extra at aid stations for something different. But its wasn't for long because a minute of two after we arrived, she'd leave carrying food and take off down the trail! 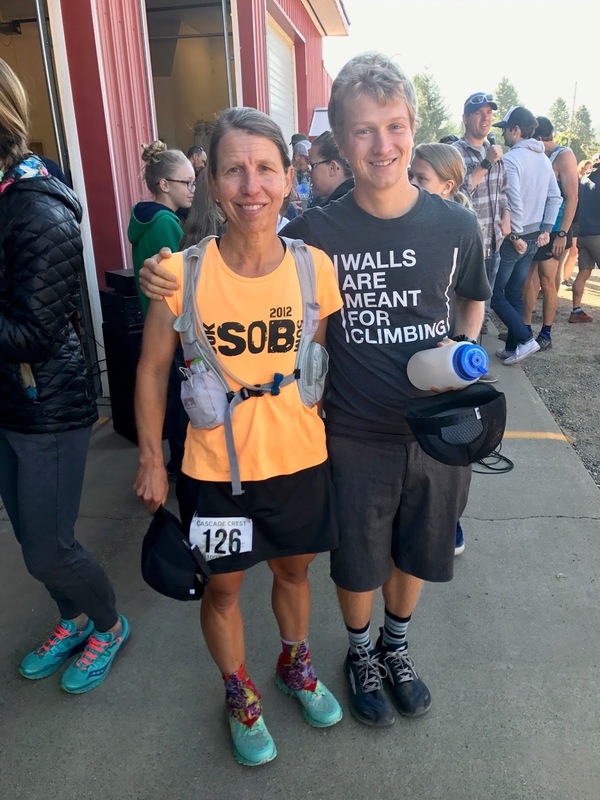 The last 14 miles of the course was pretty tough with some steep rocky climbs and descents, so I was very happy Mom was still in good spirits and moving well. Not only was the trail making going more challenging, so was the heat. I'm not sure how hot it was where we were running, but at the finish line it was 93 when Mom was done! The last 4 miles lead to more gentle trail, giving way to gravel road, and eventually a little bit of pavement before we hit the finish. Mom did a great job of pushing of despite the heat and the fact that she'd run 99 miles. We made our way down the gravels roads, then onto the pavement, before turning off on the last gravel section that would take us to the finish line. And then we were there! I told Mom to go ahead as I peeling off at the finish line. 100 miles in 29:04, and Mom's first hundred. What an awesome experience and what an awesome day! I'm so thankful I had the chance to pace Mom and very grateful Betsy was along with us to crew! Its all done, all 102 miles! Mom is the last name in red, but there lots more runners to come! Please pass on congratulations, from an internet stranger, to your mom. The thought of both of you having the ability and desire to run, together, for 50 miles is just awesome. With both of you being accomplished ultra-runners, your situation is unique and enviable. What a cool memory to be able to make, together. As a mom of 3 boys, I really appreciate you sharing this recap.